If you are looking for a beginner compound microscope that provides high magnification for educational applications at a reasonable price, then look no further then this model from AMSCOPE. The included 52-Piece accessory set is the icing on the cake, making it possible for kids to start exploring right out of the included case. More than just a toy, the AMSCOPE is an entire experiment kit. One of the things that set the AMSCOPE-KIDS microscope apart is the accessory kit. The microscope comes with glass slides, a shrimp hatchery and brine shrimp eggs, a petri dish and 5 prepared slides to name a few of the items. The microscope has six levels of magnification (120x, 240X, 300X, 480X, 600X and 1200X), a reflecting mirror for natural illumination and a battery operated (2 AA batteries included) built-in light for direct illumination. The microscope is ideal for young scientists age 7 to about 12. While we are still partial to the slightly higher priced My First Lab Duo Scope, the value pricing of this kit makes it the perfect purchase for the parent that wants to see if their child takes to science before making an investment in a higher quality instrument. 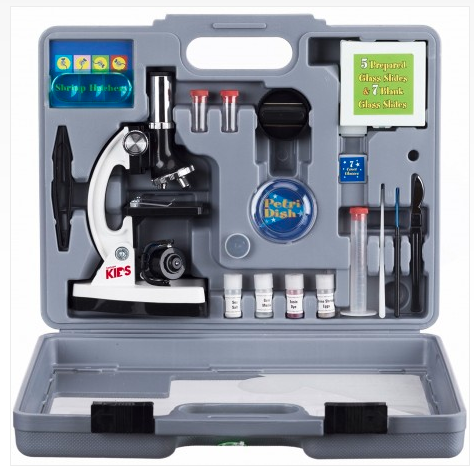 The Amscope-kids Microscope comes in a very nice plastic case that snugly holds the scope and the accessories. Opening the case reveals the microscope and all the accessories. Everything is firmly recessed. The micrscope had a coarse focus knob and a rack-and-pinion focus mechanism for more precise focusing. The lens quality is fine for elementary age kids who are looking at plants, dirt, fabric or basic forms of life, but not quite sharp enough if you are looking at items such as bacteria. Don't expect perfection in a microscope at this price point. I found the Amscope-kids Microscope to be durable. The frame of the microscope is metal, but it does have plastic parts. The LED mirror is glass and the lens housing is plastic. All of the supplied tools are also plastic, but will get the job done (plastic tweezers, stirring rod, containers). Body Type: durable metal construction.. Overall, the microscope is well made for its' audience, children 7 to 12. Young scientists can easily explore basic items such as crystals and cells. 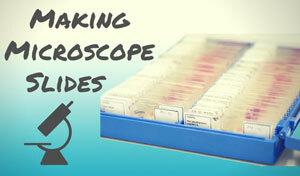 The Amscope-kids microscope is very easy to use right out of the case. The microscope has a monocular viewing head (one eye can look through the eye piece) and LED mirror illunination to make sure items are bright enough to see. The forward facing rotating turret provides 300x, 600x and 1200x magnifcation. The Amscope-kids Microscope gives you everything you need to make your own slides. We suggest starting with the smallest magnifcation and then when focused, move on to higher leels of magnification. You cannot move the stage, a feature in other higher priced models, so you will need to move the slide itself. This is a factor that will not bother elementary age users. We suggest first using the microsocpe using the corn root prepared slide, making it easier to see when you use the included blue filter. 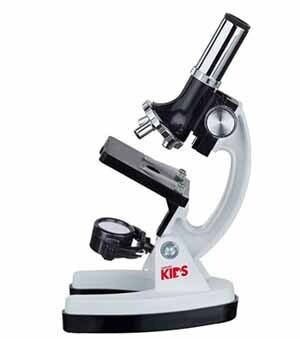 There are a few reviews for this microscope that indicate that users have had trouble focusing the instrument. We did not have that problem and found the level of magnifcation and clarity to be reasonable at this price point. You can see specific cells and even the nuclei of the cell. Just be sure to keep the slide in the center of the aperture more the most light and best viewing experience. Again instruct your child to start with the lowest level of magnification and then move up to higher levels. Turning on the light was a bit counter intuitive and involved flipping the mirror. The tools are made out of plastic, but sharp enough to get the job done. Many kids micrscopes don't have a scalpel for safety reasons, so it is nice that one is included here. 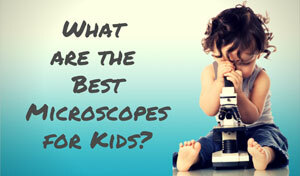 The Amscope-kids microscope is perfect for an elementary age scientist or for basic home school applications. It is a good starter microscope and comes with everything needed to see if your child takes to science. The case makes everything self contained which is another plus since you can see immediatley if anything is missing. The cons were very minor and have to do with having the right set of expectations. This unit is one step ahead of being a toy. If you have a more serious student or have a the need for more advanced applications that requires higher levels of focus, then we suggest considering a higher priced model such as the Amscope M150C, the student educational best seller. 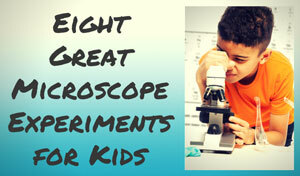 The Amscope-kids is designed for kids aged 7 to 12. It is the perfect lower priced gift for an inquisitive beginner. 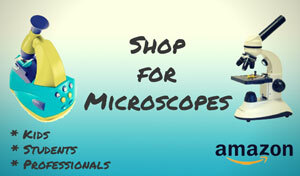 Buy the Amscope-kids M30-ABS-KT2-W at Amazon!